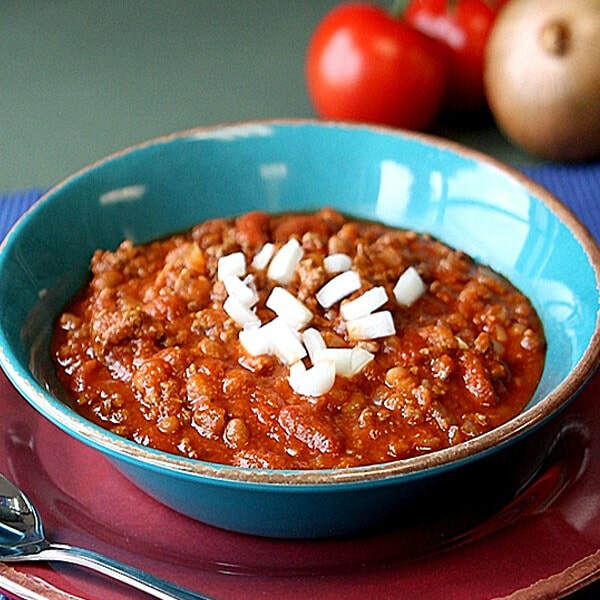 Craving a warm and hearty chili but don't want to spend hours making it? This Quick Chili recipe is for you. There is so much flexibility with this recipe because you can add as many different flavor variations as you want with toppings, vegetables and spices. Check out these other recipes for more ideas: Butternut Harvest Chili, Bean Vegetable and Barley Chili, Southwestern Sweet and Spicy Chili. Brown meat and onions in a large skillet over medium-high heat. Pour meat onto a paper towel-lined plate to drain fat. Rinse pan, and add the drained meat back to the pan. Add beans, tomatoes with liquid, chili powder and water. Reduce heat to low, cover and cook for 10 minutes. Serve hot. *Nutrition information includes 15% fat ground beef in analysis.